he oldest manuscript containing the Welsh tale of Peredur is the White Book of Rhydderch, which has been dated to about 1325. A later manuscript, probably completed around 1425, contains the Red Book of Hergest. In 1849 Lady Charlotte Guest edited and translated into English the tales related in these Welsh sources. She called her collection The Mabinogion. In 1842 some of the tales, including that of Peredur, were translated into French and included in the Contes populaires des anciens Brétons by the Comte de la Villemarqué. It was in this French version that Richard Wagner encountered the tale of Peredur of the long lance in 1860, while Wagner was developing the text of his drama Parsifal. His Bayreuth library contains a volume in German by San-Marte of tales from the Mabinogion (Die Arthur-Sage und die Märchen des rothen Buchs von Hergest). 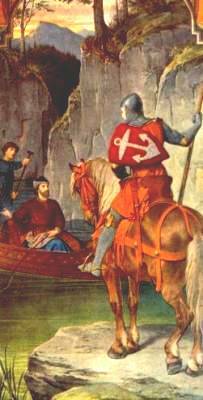 The story of Peredur is closely related to the Perceval of Chretién de Troyes, which Wagner also studied, although not until after he had completed (in August 1865) a detailed Prose Draft for his drama. The text that follows below is Lady Guest's English translation of the tale of Peredur. arl Evrawc1 owned the Earldom of the North, and he had seven sons. And Evrawc maintained himself not so much by his own possessions as by attending tournaments, and wars, and combats. And, as it often befalls those who join in encounters and wars, he was slain, and six of his sons likewise. Now the name of the seventh son was Peredur, and he was the youngest of them. And he was not of an age to go to wars and encounters, otherwise he might have been slain as his father and brothers. His mother was a scheming and thoughtful woman, and she was very solicitous concerning this her only son and his possessions. So she took counsel with herself to leave the inhabited country, and to flee to the deserts and unfrequented wildernesses. And she permitted none to bear her company thither but women and boys, and spiritless men, who were both unaccustomed and unequal to war and fighting. And none dared to bring either horses or arms where her son was, lest he should set his mind upon them. And the youth went daily to divert himself in the forest, by slinging sticks and staves. And one day he saw his mother's flock of goats, and near the goats two hinds were standing. And he marvelled greatly that these two should be without horns, while the others had them. And he thought they had long run wild and on that account they had lost their horns. And by activity and swiftness of foot, he drove the hinds and the goats together into the house which there was for the goats at the extremity of the forest. Then Peredur returned to his mother. "Ah, mother," said he, "a marvelous thing have I seen in the wood; two of thy goats have run wild, and lost their horns; through their having been so long missing in the wood. And no man had ever more trouble than I had to drive them in." Then they all arose and went to see. And when they beheld the hinds, they were greatly astonished. nd one day they saw three knights coming along the horse-road on the borders of the forest. And the three knights were Gwalchmai2 the son of Gwyar, and Geneir Gwystyl, and Owain the son of Urien. And Owain kept on the track of the knight who had divided the apples in Arthur's Court, whom they were in pursuit of. "Mother," said Peredur, "what are these yonder?" "They are angels, my son," said she. "By my faith," said Peredur, "I will go and become an angel with them." And Peredur went to the road, and met them. "Tell me, good soul," said Owain, "sawest thou a knight pass this way, wither today or yesterday?" "I know not," answered he, "what a knight is." "Such a one as I am," said Owain. "If thou wilt tell me what I ask thee, I will tell thee that which thou askest me." "Gladly will I do so," replied Owain. "What is this?" demanded Peredur, concerning the saddle. "It is a saddle," said Owain. Then he asked about all the accoutrements which he saw upon the men, and the horses, and the arms, and what they were for, and how they were used. And Owain shewed him all these things fully, and told him what use was made of them. "Go forward," said Peredur, "for I saw such a one as thou enquirest for, and I will follow thee." hen Peredur returned to his mother and her company, and he said to her, "Mother, those were not angels, but honourable knights." Then his mother swooned away. And Peredur went to the place where they kept the horses that carried firewood, and that brought meat and drink from the inhabited country to the desert. And he took a bony piebald horse, which seemed to him the strongest of them. And he pressed a pack into the form of a saddle, and with twisted twigs he imitated the trappings which he had seen upon the horses. And when Peredur came again to his mother, the Countess had recovered from her swoon. "My son," said she, "desirest thou to ride forth?" "Yes, with thy leave," said he. "Wait then, that I may counsel thee before thou goest." "Willingly," he answered, "speak quickly." "Go forward," then she said, "to the Court of Arthur, where there are the best, and the boldest, and the most bountiful of men. And wherever thou seest a church, repeat there thy Paternoster unto it. And if thou see meat and drink, and hast need of them, and none have the kindness or the courtesy to give them to thee, take them thyself. If thou hear an outcry, proceed towards it, especially if it be the outcry of a woman. If thou see a fair jewel, possess thyself of it, and give it to another, for thus thou shalt earn praise. If thou see a fair woman, pay thy court to her, whether she will or no; for thus thou wilt render thyself a better and more esteemed man than thou wast before." fter this discourse, Peredur mounted the horse, and taking a handful of sharp pointed forks in his hand, he rode forth. And he journeyed two days and two nights in the woody wildernesses, and in desert places, without food and without drink. And then he came to a vast wild wood, and far within the wood he saw a fair even glade, and in the glade he saw a tent, and seeming to him to be a church, he repeated his Paternoster to the tent. And he went towards it, and the door of the tent was open. And a golden chair was near the door. And on the chair sat a lovely auburn-haired maiden, with a golden frontlet on her forehead, and sparkling stones in the frontlet, and with a large gold ring on her hand. And Peredur dismounted, and entered the tent. And the maiden was glad at his coming, and bade him welcome. At the entrance of the tent he saw food, and two flasks full of wine, and two loaves of fine wheaten flour, and collops of the flesh of the wild boar. "My mother told me," said Peredur, "wheresoever I saw meat and drink, to take it." "Take the meat, and welcome, chieftain," said she. So Peredur took half of the meat and of the liquor himself, and left the rest to the maiden. "My mother," said he," told me, wheresoever I saw a fair jewel, to take it." "Do so, my soul," said she. So Peredur took the ring. And he mounted his horse, and proceeded on his journey. fter this, behold the knight came, to whom the tent belonged; and he was the Lord of the Glade. And he saw the track of the horse, and he said to the maiden, "Tell me who has been here since I departed." "A man," said she, "of wonderful demeanour." And she described to him what Peredur's appearance and conduct had been. "Tell me," said he, "did he offer thee any wrong?" "No," answered the maiden, "by my faith, he harmed me not." "By my faith, I do not believe thee; and until I can meet with him, and revenge the insult he has done me, and wreak my vengeance upon him, thou shalt not remain two nights in the same house." And the knight arose, and set forth to seek Peredur. eanwhile, Peredur journeyed on towards Arthur's Court. And before he reached it, another knight had been there, who gave a ring of thick gold at the door of the gate for holding his horse, and went into the Hall where Arthur and his household, and Gwenhwyver and her maidens, were assembled. And he page of the chamber was serving Gwenhwyver with a golden goblet. Then the knight dashed the liquor that was therein upon her face, and upon her stomacher, and gave her a violent blow on the face, and said, "If any have the boldness to dispute this goblet with me, and to avenge the insult to Gwenhwyver, let him follow me to the meadow, and there I will await him." So the knight took his horse, and rode to the meadow. And all the household hung down their heads, lest any of them be requested to go and avenge the insult to Gwenhwyver. For it seemed to them, that no one should have ventured on so daring an outrage, unless he possessed such powers, through magic or charms, that none could be able to take vengeance upon him. Then, behold Peredur entered the Hall, upon the bony piebald horse, with the uncouth trappings upon it; and in this way he traversed the whole length of the Hall. In the centre of the Hall stood Kai. "Tell me, tall man," said Peredur, "is that Arthur, yonder?" "What wouldest thou with Arthur?" asked Kai. "My mother told me to go to Arthur, and receive the honour of knighthood." "By my faith," said he, "thou art all too meanly equipped with horse and with arms." Thereupon he was perceived by all the household, and they threw sticks at him. Then, behold, a dwarf came forward. He had already been a year at Arthur's Court, both he and a female dwarf. They had craved harbourage of Arthur, and had obtained it; and during the whole year, neither of them had spoken a single word to any one. When the dwarf beheld Peredur, "Ha ha!" said he, "the welcome of Heaven be unto thee, goodly Peredur, son of Evrawc, the chief of warriors, and flower of knighthood." "Truly," said Kai, "thou art ill-taught to remain a year mute at Arthur's Court, with choice of society; and now, before the face of Arthur and all his household, to call out, and declare such a man as this the chief of warriors, and the flower of knighthood." And he gave him such a box on the ear, and he fell senseless to the ground. Then exclaimed the female dwarf, "Ha ha! goodly Peredur, son of Evrawc; the welcome of Heaven be unto thee, flower of knights, and light of chivalry." "Of a truth, maiden," said Kai, " thou art ill-bred to remain mute for a year at the Court of Arthur and then to speak as thou dost as such a man as this." And Kai kicked her with his foot, so that she fell to the ground senseless. "Tall man," said Peredur, "show me which is Arthur." "Hold thy peace," said Kai, "and go after the knight who went hence to the meadow, and take from him the goblet, and overthrow him, and possess thyself of his horse and arms, and then thou shalt receive the order of knighthood." "I will do so, tall man," said Peredur. So he turned his horse's head towards the meadow. And when he came there, the knight was riding up and down, proud of his strength, and valour, and noble mien. "Tell me," said the knight, "didst thou see any one coming after me from the Court?" "The tall man that was there," said he, "desired me to come, and overthrow thee, and to take from thee the goblet, and thy horse and thy armour for myself." "Silence," said the knight; "go back to the Court, and tell Arthur, from me, either to come himself, or to send some other to fight with me; and unless he do so quickly, I will not wait for him." "By my faith," said Peredur, "choose thou whither it shall be willingly or unwillingly, but I will have the horse, and the arms, and the goblet." And upon this the knight ran at him furiously, and struck him a violent blow with the shaft of his spear, between the neck and the shoulder. "Ha ha! lad," said Peredur, "my mother's servants were not used to play with me in the wise; therefore, thus will I play with thee." And thereupon he struck him with a sharp pointed fork, and it hit him in the eye, and came out at the back of his neck, so that he instantly fell down lifeless. erily, said Owain the son of Urien to Kai, "thou wert ill advised, when thou didst send that madman after the knight. For one of two things must befall him. He must either be overthrown, or slain. 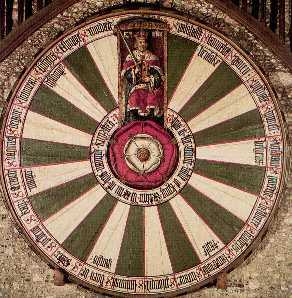 If he is overthrown by the knight, he will be counted by him to be an honourable person of the Court, and an eternal disgrace will it be to Arthur and his warriors. And if he is slain, the disgrace will be the same, and moreover, his sin will be upon him; therefore will I go to see what has befallen him." So Owain went to the meadow and he found Peredur dragging the man about. "What art thou doing thus?" said Owain. "This iron coat," said Peredur, "will never come from off him; not by my efforts, at any rate." And Owain unfastened his armour and his clothes. "Here, my good soul," said he, "is a horse and armour better than thine. Take them joyfully, and come with me to Arthur, to receive the order of knighthood, for thou dost merit it." "May I never shew my face again, if I go," said Peredur, "but take thou the goblet to Gwenhwyvar, and tell Arthur, that wherever I am, I will be his vassal, and will do him what profit and service I am able. And say that I will not come to his Court, until I have encountered the tall man that is there, to avenge the injury he did to the dwarf and dwarfess." And Owain went back to the Court, and related all these things to Arthur and Gwenhwyvar, and to all the household. nd Peredur rode forward. And as he proceeded, behold a knight met him. "Whence comest thou?" said the knight. "I come from Arthur's Court," said Peredur. "Art thou one of his men?" asked he. "Yes, by my faith," he answered. "A good service, truly, is that of Arthur." "Wherefore sayest thou so?" said Peredur. "I will tell thee," said he, "I have always been Arthur's enemy, and all such of his men as I have ever encountered, I have slain." And without further parlance, they fought, and it was not long before Peredur brought him to the ground, over his horse's crupper. Then the knight besought his mercy. "Mercy thou shalt have," said Peredur, "if thou wilt make an oath to me, that thou wilt go to Arthur's Court, and tell him that it was I that overthrew thee, for the honour of his service; and say that I will never come to the Court, until I have avenged the insult offered to the dwarf and dwarfess." The knight pledged him the faith of this, and proceeded to the Court of Arthur, and said as he had promised, and conveyed the threat to Kai. nd Peredur rode forward. And within that week he encountered sixteen knights, and overthrew them all shamefully. And they all went to Arthur's Court, taking with them the same message which the first knight had conveyed from Peredur, and the same threat which he had sent to Kai. And thereupon Kai was reproved by Arthur; and Kai was greatly grieved thereat. nd Peredur rode forward. And he came to a vast and desert wood, on the confines of which was a lake. And on the other side was a fair castle. And on the border of the lake he saw a venerable hoary-headed man sitting upon a velvet cushion, and having a garment of velvet upon him. And his attendants were fishing in the lake. When the hoary-headed man beheld Peredur approaching, he arose, and went towards the castle. And the old man was lame. Peredur rode to the palace, and the door was open, and he entered the hall. And there was the hoary-headed man sitting on a cushion, and a large blazing fire burning before him. And the household and the company arose to meet Peredur, and disarrayed him. And the man asked the youth to sit on the cushion; and they sat down, and conversed together. When it was time, the tables were laid, and they went to meat. And when they had finished their meal, the man enquired of Peredur, if he knew well how to fight with the sword. "I know not," said Peredur, "but were I to be taught, doubtless I should." "Whoever can play well with the cudgel and shield, will also be able to fight with a sword." And the man had two sons; the one had yellow hair, and the other auburn. "Arise, youth," said he, "and play with the cudgel and the shield." And so did they. "Tell me, my soul," said the man, "which of the youths thinkest thou plays best?" "I think," said Peredur, "that the yellow-haired youth could draw blood from the other, if he chose." "Arise thou, my life, and take the cudgel and the shield from the hand of the youth with the auburn hair, and draw blood from the yellow-haired youth, if thou canst." So Peredur arose, and went to play with the yellow-haired youth; and he lifted up his arm, and struck him such a mighty blow, that his brow fell over his eye, and the blood flowed forth. "Ah, my life," said the man, "come now, and sit down, for thou wilt become the best fighter with the sword of any in this island; and I am thy uncle, thy mother's brother. And with me thou shalt remain a space, in order to learn the manners and customs of different countries, and courtesy, and gentleness, and noble bearing. Leave, then, the habits and the discourse of thy mother, and I will be thy teacher; and I will raise thee to the rank of knight from this time forward. And thus do thou. If thou seest ought to cause thee wonder, ask not the meaning of it; if no one has the courtesy to inform thee, the reproach will not fall upon thee, but upon me that am thy teacher." And they had abundance of honour and service. And when it was time, they went to sleep. the break of day, Peredur arose, and took his horse, and with his uncle's permission, he rode forth. And he came to a vast desert wood, and at the further end of the wood was a meadow, and on the other side of the meadow he saw a large castle. And thitherward Peredur bent his way, and he found the gate open, and he proceeded to the hall. And he beheld a stately hoary-headed man sitting on one side of the hall, and many pages around him, who arose to receive and to honour Peredur. And they placed him by the side of the owner of the palace. Then they discoursed together; and when it was time to eat, they caused Peredur to sit beside the nobleman during the repast. And when they had eaten and drank as much as they desired, the nobleman asked Peredur, whither he could fight with a sword? "Were I to receive instruction," said Peredur, "I think I could." Now, there was on the floor of the hall a huge staple, as large as a warrior could grasp. "Take yonder sword," said the man to Peredur, "and strike the iron staple." So Peredur arose, and struck the staple, so that he cut it in two; and the sword broke into two parts also. "Place the two parts together, and reunite them," and Peredur placed them together, and they became entire as they were before. And a second time he struck upon the staple, so that both it and the sword were broke in two, and as before they reunited. And the third time he gave it a like blow, and placed the broken parts together, and neither the staple nor the sword would unite, as before. "Youth," said the nobleman, "come now and sit down, and my blessing be upon thee. Thou fightest best with the sword of any man in the kingdom. Thou hast arrived at two-thirds of thy strength, and the other third thou hast not yet obtained; and when thou attainest to thy full power, none will be able to contend with thee. I am thy uncle, thy mother's brother3, and I am brother to the man in whose house thou wast last night." hen Peredur and his uncle discoursed together, and he beheld two youths enter the hall, and proceed up to the chamber, bearing a spear of mighty size, with three streams of blood flowing from the point to the ground. And when all the company saw this, they began wailing and lamenting. But for all that, the man did not break off his discourse with Peredur. And as he did not tell Peredur the meaning of what he saw, he forebore to ask him concerning it. And when the clamour had a little subsided, behold two maidens entered, and a large salver between them, in which was a man's head, surrounded by a profusion of blood. And thereupon the company of the court made so great an outcry, that it was irksome to be in the same hall with them. But at length they were silent. And when time was that they should sleep, Peredur was brought into a fair chamber. nd the next day, with his uncle's permission, he rode forth. And he came to a wood, and far within the wood he heard a loud cry, and he saw a beautiful woman with auburn hair, and a horse with a saddle upon it, standing near her, and a corpse by her side. And as she strove to place the corpse upon the horse, it fell to the ground, and thereupon she made a great lamentation. "Tell me, sister," said Peredur, "wherefore art thou bewailing?" "Oh, accursed Peredur, little pity has my ill fortune ever met with from thee." "Wherefore," said Peredur, "am I accursed?" "Because thou wast the cause of thy mother's death; for when thou didst ride forth against her will, anguish seized upon her heart, so that she died; and therefore art thou accursed. And the dwarf and the dwarfess that thou sawest at Arthur's Court, were the dwarfs of thy father and mother; and I am thy foster-sister, and this was my wedded husband, and he was slain by the knight that is in the glade in the wood; and do not thou go near him, lest thou shouldest be slain by him likewise." "My sister, thou dost reproach me wrongfully; through my having so long remained amongst you, I shall scarcely vanquish him; and had I continued longer it would, indeed, be difficult for me to succeed. Cease, therefore, thy lamenting, for it is of no avail, and I will bury the body, and then I will go in quest of the knight, and see if I can do vengeance upon him." And when he had buried the body, they went to the place where the knight was, and found him riding proudly along the glade; and he enquired of Peredur whence he came. "I come from Arthur's Court." "And art thou one of Arthur's men?" "Yes, by my faith." "A profitable alliance, truly, is that of Arthur." And without further parlance, they encountered one another, and immediately Peredur overthrew the knight, and he besought mercy of Peredur. "Mercy shalt thou have," said he, "upon these terms, that thou take this woman in marriage, and do her all the honour and reverence in thy power, seeing thou hast, without cause, slain her wedded husband; and that thou go to Arthur's Court, and shew him that it was I that overthrew thee, to do him honour and service; and that thou tell him that I will never come to his Court again until I have met with the tall man that is there, to take vengeance upon him for his insult to the dwarf and dwarfess." And he took the knight's assurance, that he would perform all this. Then the knight provided the lady with a horse and garments that were suitable for her, and took her with him to Arthur's Court. And he told Arthur all that had occurred, and gave the defiance to Kai. And Arthur and all his household reproved Kai, for having driven such a youth as Peredur from his Court. Said Owain the son of Urien, "This youth will never come into the Court until Kai has gone forth from it." "By my faith," said Arthur, "I will search all the deserts in the island of Britain, until I find Peredur, and then let him and his adversary do their utmost to each other." hen Peredur rode forward. And he came to a desert wood, where he saw not the track either of men or animals, and where there was nothing but bushes and weeds. And at the upper end of the wood he saw a vast castle, wherein were many strong towers; and when he came near the gate, he found the weeds taller than he had done elsewhere. And he struck the gate with the shaft of his lance, and thereupon behold a lean auburn-haired youth came to an opening in the battlements. "Choose thou, chieftain," said he. "Whether I shall open the gate unto thee, or shall I announce unto those that are chief, that thou art at the gateway?" "Say that I am here," said Peredur, "and if it is desired that I should enter, I will go in." And the youth came back, and opened the gate for Peredur. And when he went into the hall, he beheld eighteen youths, lean and red-headed, of the same height and of the same aspect, and of the same dress, and of the same age as the one who had opened the gate for him. And they were well skilled in courtesy and in service. And they disarrayed him. Then they sat down to discourse. Thereupon, behold five maidens came from the chamber into the hall. And Peredur was certain that he had never seen another of so fair an aspect as the chief of the maidens. And she had an old garment of satin upon her, which had once been handsome, but was then so tattered, that her skin could be seen through it. And whiter was her skin than the bloom of crystal, and her hair and her two eyebrows were blacker than jet, and on her cheeks were two red spots, redder than whatever is reddest. And the maiden welcomed Peredur, and put her arms about his neck, and made him sit down beside her. Not long after this he saw two nuns enter and a flask full of wine was borne by one, and six loaves of white bread by the other. "Lady," said they, "Heaven is witness, that there is not so much of food and liquor as this left in yonder Convent this night." Then they went to meat, and Peredur observed that the maiden wished to give more of the food and of the liquor to him than to any of the others. "My sister," said Peredur, "I will share out the food and the liquor." "Not so, my soul," said she. "By my faith, but I will." So Peredur took the bread, and he gave an equal portion of it to each alike, as well as a cup full of the liquor. And when it was time for them to sleep, a chamber was prepared for Peredur, and he went to rest. ehold, sister, said the youths to the fairest and most exalted of the maidens, "we have counsel for thee." "What may it be?" she enquired. "Go to the youth that is in the upper chamber, and offer to become his wife, or the lady of his love, if it seem well to him." "That were indeed unfitting," said she. "Hitherto I have not been the lady love of any knight, and to make him such an offer before I am wooed by him, that, truly can I not do." "By our confession to Heaven, unless you actest thus, we will leave thee here to thy enemies, to do as they will with thee." And through fear of this, the maiden went forth; and shedding tears, she proceeded to the chamber. And with the noise of the door opening, Peredur awoke; and the maiden was weeping and lamenting. "Tell me, my sister," said Peredur, "wherefore dost thou weep?" "I will tell thee, lord," said she, "my father possessed these dominions as their chief, and this palace was his, and with it he held the best earldom in the kingdom; then the son of another earl sought me of my father, and I was not willing to be given unto him, and my father would not give me against my will, either to him or any earl in the world. And my father had no child except myself. And after my father's death, these dominions came into my own hands, and then was I less willing to accept him than before. So he made war upon me, and conquered all my possessions except this one house. And through the valour of the men whom thou hast seen, who are my foster brothers, and the strength of the house, it can never be taken while food and drink remain. And now our provisions are exhausted; but as thou hast seen, we have been fed by the nuns, to whom the country is free. And at length they also are without supply of food or liquor. And at no later date than tomorrow, the earl will come against this place with all his forces; and if I fall into his power, my fate will be no better than to be given over to the grooms of his horses. Therefore, lord, I am come to offer to place myself in thy hands, that thou mayest succour me, either by taking me hence, or by defending me here, whichever may seem best unto thee." "Go, my sister," said he, "and sleep; nor will I depart from thee until I do that which thou requirest, or prove whether I can assist thee or not." The maiden went again to rest; and the next morning she came to Peredur, and saluted him. "Heaven prosper thee, my soul, and what tidings dost thou bring?" "None other, than that the earl and all his forces have alighted at the gate, and I never beheld any place so covered with tents, and thronged with knights challenging others to the combat." "Truly," said Peredur, "let my horse be made ready." So his horse was accoutred, and he arose, and sallied forth to the meadow. And there was a knight riding proudly along the meadow, having raised the signal for battle. And they encountered, and Peredur threw the knight over his horse's crupper to the ground. And at the close of the day, one of the chief knights came to fight with him, and he overthrew him also, so that he besought his mercy. "Who art thou?" said Peredur. "Verily," said he, "I am Master of the Household to the earl." "And how much of the Countess's possessions is there in thy power?" "The third part, verily," answered he. "Then," said Peredur, "restore to her the third of her possessions in full, and all the profit thou hast made by them, and bring meat and drink for a hundred men, with their horses and arms, to her court this night. And thou shalt remain her captive, unless she wish to take thy life." And this he did forthwith. And that night the maiden was right joyful, and they fared plenteously. nd the next day Peredur rode forth to the meadow; and that day he vanquished a multitude of the host. And at the close of the day, there came a proud and stately knight, and Peredur overthrew him, and he besought his mercy. "Who art thou?" said Peredur. "I am Steward of the Palace," said he. "And how much of the maiden's possessions are under thy control?" "One third part," answered he. "Verily," said Peredur, "thou shalt fully restore to the maiden her possessions, and, moreover, thou shalt give her meat and drink for two hundred men, and their horses and their arms. And for thyself, thou shalt be her captive." And immediately it was so done. nd the third day Peredur rode forth to the meadow; and he vanquished more that day than on either of the proceeding. And at the close of the day, an earl came to encounter him, and he overthrew him, and he besought his mercy. "Who art thou?" said Peredur. "I am the earl," said he. "I will not conceal it from thee." "Verily," said Peredur, "thou shalt restore the whole of the maiden's earldom, and shalt give her thine own earldom in addition thereto, and meat and drink for three hundred men, and their horses and arms, and thou thyself shall remain in her power." And thus it was fulfilled. And Peredur tarried three weeks in the country, causing tribute and obedience to be paid to the maiden, and the government to placed in her hands. "With thy leave," said Peredur, "I will go hence." "Verily, my brother, desirest thou this?" "Yes, by my faith; and had it not been for love of thee, I should not have been here thus long." "My soul," said she, "who art thou?" "I am Peredur the son of Evrawc from the North; and if ever thou art in trouble or in danger, acquaint me therewith, and if I can, I will protect thee." o Peredur rode forth. And far thence there met him a lady, mounted on a horse that was lean, and covered with sweat; and she saluted the youth. "Whence comest thou, my sister?" Then she told him the cause of her journey. Now she was the wife of the Lord of the Glade4. "Behold," said he, "I am the knight through whom thou art in trouble, and he shall repent it, who has treated thee thus." Thereupon, behold a knight rode up, and he enquired of Peredur, if he had seen a knight such as he was seeking. "Hold thy peace," said Peredur, "I am he whom thou seekest; and by my faith, thou deservest ill of thy household for thy treatment of the maiden, for she is innocent concerning me." So they encountered, and they were not long in combat ere Peredur overthrew the knight, and he besought his mercy. "Mercy thou shalt have," said Peredur, "so thou wilt return by the way thou camest, and declare that thou holdest the maiden innocent, and so that thou wilt acknowledge unto her the reverse thou hast sustained at my hands." And the knight plighted him his faith thereto. hen Peredur rode forward. And above him he beheld a castle, and thitherward he went. And he struck upon the gate with his lance, and then, behold a comely auburn-haired youth opened the gate, and he had the stature of a warrior, and the years of a boy. And when Peredur came into the hall, there was a tall and stately lady sitting in a chair, and many handmaidens around her; and the lady rejoiced at his coming. And when it was time, they went to meat. And after their repast was finished, "It were well for thee, chieftain," said she, "to go elsewhere to sleep." "Wherefore can I not sleep here?" said Peredur. "Nine sorceresses are here, my soul, of the sorceresses of Gloucester, and their father and their mother are with them; and unless we can make our escape before daybreak, we shall be slain; and already they have conquered and laid waste all the country, except this one dwelling." "Behold," said Peredur, "I will remain here tonight, and if you are in trouble, I will do you what service I can; but harm shall you not receive from me." So they went to rest. And with the break of day, Peredur heard a dreadful outcry. And he hastily arose, and went forth in his vest and his doublet, with his sword about his neck, and he saw a sorceress overtake one of the watch, who cried out violently. Peredur attacked the sorceress, and struck her upon the head with his sword, so that he flattened her helmet and her headpiece like a dish upon her head. "Thy mercy, goodly Peredur, son of Evrawc, and the mercy of Heaven." "How knowest thou, hag, that I am Peredur?" "By destiny, and the foreknowledge that I should suffer harm from thee. And thou shalt take a horse and armour of me; and with me thou shalt go to learn chivalry and the use of thy arms." Said Peredur, "Thou shalt have mercy, if thou pledge thy faith thou wilt never more injure the dominions of the Countess." And Peredur took surety of this, and with permission of the Countess, he set forth with the sorceress to the palace of the sorceresses. And there he remained for three weeks, and then he made choice of a horse and arms, and went his way. nd in the evening he entered a valley, and at the head of the valley he came to a hermit's cell, and the hermit welcomed him gladly, and there he spent the night. And in the morning he arose, and when he went forth, behold a shower of snow had fallen the night before, and a hawk had killed a wild fowl in front of the cell. And the noise of the horse scared the hawk away, and a raven alighted upon the bird. And Peredur stood, and compared the blackness of the raven, and the whiteness of the snow, and the redness of the blood, to the hair of the lady that best he loved, which was blacker than jet, and to her skin which was whiter than the snow, and to the two red spots upon her cheeks, which were redder than the blood upon the snow appeared to be. ow Arthur and his household were in search of Peredur. "Know ye," said Arthur, "who is the knight with the long spear that stands by the brook up yonder?" "Lord," said one of them, "I will go and learn who he is." So the youth came to the place was Peredur was, and asked him what he did thus, and who he was. And from the intensity with which he thought upon the lady whom best he loved, he gave him no answer. Then the youth thrust at Peredur with his lance, and Peredur turned upon him, and struck him over his horse's crupper to the ground. And after this, four and twenty youths came to him, and he did answer one more than another, but gave the same reception to all, bringing them with one single thrust to the ground. And then came Kai, and spoke to Peredur rudely and angrily; and Peredur took him with his lance under the jaw, and cast him from him with a thrust, so that he broke his arm and his shoulder blade, and he rode over him one and twenty times. And while he lay thus, stunned with the violence of the pain that he had suffered, his horse returned back at a wild and prancing pace. And when the household saw the horse come back without his rider, they set forth, they rode forth in haste to the place where the encounter had been. And when they first came there, they thought that Kai was slain; but they found that if he had a skilful physician, he yet might live. And Peredur moved not from his meditation, on seeing the concourse that was around Kai. And Kai was brought to Arthur's tent, and Arthur caused skilful physicians to come to him. And Arthur was grieved that Kai had met with this reverse, for he loved him greatly. hen, said Gwalchmai, "it is not fitting that any should disturb an honourable knight from his thought unadvisedly; for either he is pondering some damage that he has sustained, or he is thinking of the lady whom best he loves. And through such ill-advised proceeding, perchance this misadventure has befallen him who last met with him. And if it seem well to thee, lord, I will go and see if this knight has changed from his though; and if he has, I will ask him courteously to come and visit thee." Then Kai was wrath, and he spoke angry and spiteful words. "Gwalchmai," said he, "I know that thou wilt bring him because he is fatigued. Little praise and honour, nevertheless, wilt thou have from vanquishing a weary knight, who is tired with fighting. Yet, thus hast thou gained the advantage over many. And while thy speech and thy soft words last, a coat of thin linen were armour sufficient for thee, and thou wilt not need to break either lance or sword in fighting with the knight in the state he is in." Then said Gwalchmai to Kai, "thou mightest use more pleasant words, wert thou so minded; and it behoves thee not upon me to wreak thy wrath and thy displeasure. Methinks I shall bring the knight hither with me without breaking either my arm or my shoulder." Than said Arthur to Gwalchmai, "Thou speakest like a wise and a prudent man; go and take enough of armour about thee, and choose thy horse." And Gwalchmai accoutred himself, and rode forward hastily to the place where Peredur was. 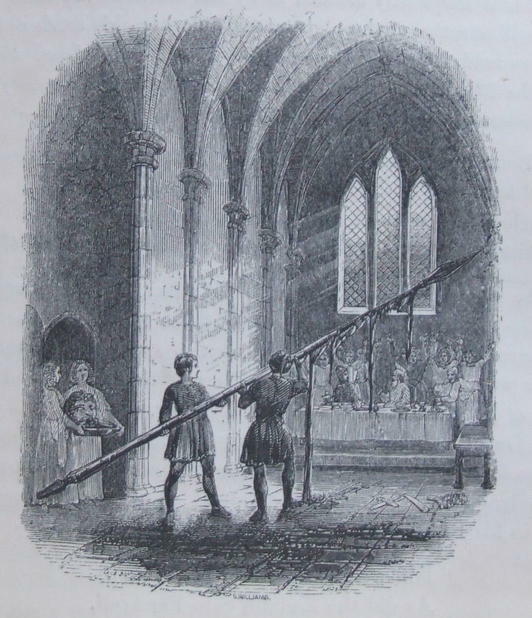 nd Peredur was resting on the shaft of his spear, pondering the same thought, and Gwalchmai came to him without any signs of hostility, and said to him, "If I thought that it would be as agreeable to thee as it would be to me, I would converse with thee. I have also a message from Arthur unto thee, to pray thee to come and visit him. And two men have been before on this errand." "That is true," said Peredur, "and uncourteously they came. They attacked me, and I was annoyed thereat, for it was not pleasing to me to be drawn from the thought that I was in, for I was thinking of the lady whom best I love; and thus was she brought to my mind, --I was looking upon the snow, and upon the raven, and upon the drops of the blood of the bird that the hawk had killed upon the snow. And I bethought me that her whiteness was like that of the snow, and that the blackness of her hair and her eyebrows was like that of the raven, and that the two red spots upon her cheeks were like the two drops of blood." Said Gwalchmai, "This was not an ungentle thought, and I should marvel if it were pleasant to thee to be drawn from it." "Tell me," said Peredur, "is Kai in Arthur's Court?" "He is," said he, "and behold, he is the knight that fought with thee last; and it would have been better for him had he not come, for his arm and his shoulder blade were broken with the fall which he had from thy spear." "Verily," said Peredur, "I am not sorry to have thus begun to avenge the insult to the dwarf and dwarfess." Then Gwalchmai marvelled to hear him speak of the dwarf and the dwarfess; and he approached him, and threw his arms around his neck, and asked him what was his name. "Peredur the son of Evrawc am I called," said he, "and thou? Who art thou?" "I am called Gwalchmai," he replied. "I am right glad to meet with thee," said Peredur, "for in every country where I have been, I have heard of thy fame for prowess and uprightness, and I solicit thy fellowship." "Thou shalt have it, by my faith, and grant me thine," said he. "Gladly will I do so," answered Peredur. o they rode forth together joyfully towards the place where Arthur was; and when Kai saw them coming, he said, "I knew that Gwalchmai needed not to fight the knight. And it is no wonder that he should gain fame; more can he do by his fair words, than I by the strength of my arm." And Peredur went with Gwalchmai to his tent, and they took off their armour. And Peredur put on garments like those that Gwalchmai wore; and they went together unto Arthur, and saluted him. "Behold, lord,"said Gwalchmai, "him whom thou hast sought so long." "Welcome unto thee, chieftain," said Arthur. "With me thou shalt remain; and had I known thy valour had been such, thou shouldst not have left me as thou didst. Nevertheless, this was predicted of thee by the dwarf and the dwarfess, whom Kai ill treated, and whom thou hast avenged." And hereupon, behold there came the Queen and her handmaidens, and Peredur saluted them. And they were rejoiced to see him, and bade him welcome. And Arthur did him great honour and respect, and they returned towards Caerlleon. nd the first night, Peredur came to Caerlleon, to Arthur's Court, and as he walked in the city after his repast, behold there met him Angharad Law Evrawc. "By my faith, sister," said Peredur, "thou art a beauteous and lovely maiden; and were it pleasing to thee, I could love thee above all women." "I pledge my faith," said she, "that I do not love thee, nor will I ever do so." "I also pledge my faith," said Peredur, "that I will never speak a word to any Christian again, until thou come to love me above all men." he next day, Peredur went forth by the high road, along a mountain ridge, and he saw a valley of a circular form, the confines of which were rocky and wooded. And the flat part of the valley was in meadows, and there were fields betwixt the meadows and the wood. And in the bosom of the wood he saw large black houses, of uncouth workmanship. And he dismounted, and led his horse towards the wood. And a little way within the wood he saw a rocky ledge, along which the road lay. And upon the ledge was a lion bound by a chain, and sleeping. And beneath the lion he saw a deep pit, of immense size, full of bones of men and animals. And Peredur drew his sword, and struck the lion, so that he fell into the mouth of the pit, and hung there by the chain; and with a second blow he struck the chain, and broke it, and the lion fell into the pit, and Peredur led his horse over the rocky ledge, until he came into the valley. And in the centre of the valley he saw a fair castle, and he went towards it. And in the meadow by the castle he beheld a huge grey man sitting, who was larger than any man he had ever before seen. And two young pages were shooting the hilts of their daggers, of the bone of the sea horse. And one of the pages had red hair, and the other auburn. And they went before him to the place where the grey man was. And Peredur saluted him. And the grey man said, "Disgrace to the beard of my porter." Then Peredur understood that the porter was the lion. And the grey man and the pages went together into the Castle, and Peredur accompanied them; and he found it a fair and noble place. And they proceeded to the hall, and the tables were already laid, and upon them was abundance of food and liquor. And thereupon he saw an aged woman and a young woman come from the chamber; and they were the most stately women he had ever seen. Then they washed, and went to meat, and the grey man sat in the upper seat at the head of the table, and the aged woman next to him. And Peredur and the maiden were placed together; and the two young pages served them. And the maiden gazed sorrowfully upon Peredur, and Peredur asked the maiden wherefore she was sad. "For thee, my soul; for, from when I first beheld thee, I have loved thee above all men. And it pains me to know that so gentle a youth as thou should have such a doom as awaits thee tomorrow. Sawest thou the numerous black houses in the bosom of the wood. All these belong to the vassals of the grey man yonder, who is my father. And they all are giants. And tomorrow they will rise up against thee, and will slay thee. 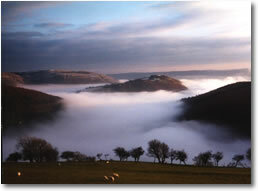 And the Round Valley is this valley called." "Listen, fair maiden, wilt thou contrive that my horse and arms be in the same lodging with me tonight." "Gladly will I cause it so to be, by Heaven, if I can." nd when it was time for them to sleep rather than to carouse, they went to rest. And the maiden caused Peredur's horse and arms to be in the same lodging with him. And the next morning Peredur heard a great tumult of men and horses around the Castle. And Peredur arose, and armed himself and his horse, and went to the meadow. Then the aged woman and the maiden came to the grey man, "Lord," said they, "take the word of the youth, that he will never disclose what he has seen in this place, and we will be his sureties that he keep it." "I will not do so, my faith," said the grey man. So Peredur fought with the host; and towards evening, he had slain the one-third of them without receiving any hurt himself. Then said the aged woman, "Behold, many of thy host have been slain by the youth. Do thou, therefore, grant him mercy." "I will not grant it, by my faith," said he. And the aged woman and the fair maiden were upon the battlements of the Castle, looking forth. And at that juncture, Peredur encountered the yellow-haired youth, and slew him. "Lord," said the maiden, "grant the young man mercy." "That will I not do, by Heaven," he replied; and thereupon Peredur attacked the auburn-haired youth, and slew him likewise. "It were better thou hadst accorded mercy to the youth, before he had slain thy two sons; for now scarcely wilt thou thyself escape from him." "Go, maiden, and beseech the youth to grant mercy unto us, for we yield ourselves into his hands." So the maiden came to the place where Peredur was, and besought mercy for her father, and for all such of his vassals as had escaped alive. "Thou shalt have it, on condition that thy father, and all that are under him, go and render homage to Arthur, and tell him that it was his vassal Peredur that did him this service." "This will we do willingly, by Heaven." "And you shall also receive baptism; and I will send to Arthur, and beseech him to bestow this valley upon thee, and upon thy heirs after thee for ever." Then they went in, and the grey man and the tall woman saluted Peredur. And the grey man said unto him, "Since I have possessed this valley, I have not seen any Christian depart with his life, save thyself. And we will go to do homage to Arthur, and to embrace the faith, and be baptized." Then said Peredur, "To Heaven I render thanks that I have not broken my vow to the lady that best I love, which was, that I would not speak one word unto any Christian." hat night they tarried there. And the next day, in the morning, the grey man, with his company, set forth to Arthur's Court; and they did homage unto Arthur, and he caused them to be baptized. And the grey man told Arthur, that it was Peredur that had vanquished them. And Arthur gave the valley to the grey man and his company, to hold it of him as Peredur had besought. And with Arthur's permission, the grey man went back to the Round Valley. eredur rode forward next day, and he traversed a vast tract of desert, in which no dwellings were. And at length he came to a habitation, mean and small. And there he heard that there was a serpent that lay upon a gold ring, and suffered none to inhabit the country for seven miles around. And Peredur came to the place where he heard the serpent was. And angrily, furiously, and desperately, fought he with the serpent; and at the last he killed it, and took away the ring. And thus he was for a long time without speaking a word to any Christian. And therefrom he lost his colour and his aspect, through extreme longing after the Court of Arthur, and the society of the lady whom best he loved, and of his companions. Then he proceeded forward to Arthur's Court, and on there met him Arthur's household, going on a particular errand, with Kai at their head. And Peredur knew them all, but none of the household recognised him. "Whence comest thou, chieftain?" said Kai. And this he asked him twice, and three times, and he answered him not. And Kai thrust him through the thigh with his lance. And lest he be compelled to speak, and to break his vow, he went on without stopping. "Then," said Gwalchmai, "I declare to Heaven, Kai, that thou hast acted ill in committing such an outrage on a youth like this, who cannot speak." And Gwalchmai returned back to Arthur's Court. "Lady," said he to Gwenhwyvar, "seest thou how wicked an outrage Kai has committed upon this youth who cannot speak; for Heaven's sake, and for mine, cause him to have medial care before I come back, and I will repay thee the charge." nd before the men returned from their errand, a knight came to the meadow beside Arthur's Palace, to dare some one to the encounter. And his challenge was accepted; and Peredur fought with him, and overthrew him. And for a week he overthrew one knight every day. 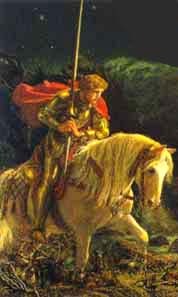 nd one day, Arthur and his household were going to Church, and they beheld a knight who had raised the signal for combat. "Verily," said Arthur, "by the valour of men, I will not go hence until I have my horse and my arms to overthrow yonder boor." Then went the attendants to fetch Arthur's horse and arms. And Peredur met the attendants as they were going back, and he took the horse and arms from them, and proceeded to the meadow; and all those who saw him arise and go to do battle with the knight, went upon the tops of the houses, and the mounds, and the high places, to behold the combat. And Peredur spurred his horse, and ran at him wrathfully, furiously, fiercely, desperately, and with mighty rage, and he gave him a thrust, deadly-wounding, severe, furious, adroit and strong, under his jaw, and raised him out of his saddle, and cast him a long way from him. And Peredur went back, and left the horse and the arms with the attendant as before, and he went on foot to the Palace. hen Peredur went by the name of the Dumb Youth. And behold, Angharad Law Evrawc met him. "I declare to Heaven, chieftain," said she, "woeful is it that thou canst not speak; for couldst thou speak, I would love thee best of all men; and by my faith, although thou canst not, I do love thee above all." "Heaven reward thee, my sister." Thereupon was it known that he was Peredur. And then he held fellowship with Gwalchmai, and Owain the son of Urien, and all the household, and he remained in Arthur's Court. rthur was in Caerlleon upon Usk; and he went to hunt, and Peredur went with him. And Peredur let loose his dog upon a hart, and the dog killed the hart in a desert place. And a short space from him he saw signs of a dwelling, and towards the dwelling he went, and he beheld a hall, and at the door of the hall he found bald swarthy youths playing at chess. And when he entered, he beheld three maidens sitting on a bench, and they were all clothed alike, as became persons of high rank. And he came, and sat by them upon the bench; and one of the maidens looked steadfastly upon Peredur, and wept. And Peredur asked her wherefore she was weeping. " Through grief, that I should see so fair a youth as thou art, slain." "Who will slay me?" inquired Peredur. "If thou art so daring as to remain here tonight, I will tell thee." "How great soever my danger may be from remaining here, I will listen unto thee." "This Palace is owned by him who is my father," said the maiden, "and he slays every one who comes hither without his leave." What sort of a man is thy father, that he is able to slay every one thus?" "A man who does violence and wrong unto his neighbours, and who renders justice unto none." And hereupon he saw the youths arise and clear the chessmen from the board. And he heard a great tumult; and after the tumult there came in a huge black one-eyed man, and the maidens arose to meet him. And they disarrayed him, and he went and sat down; and after he had rested and pondered awhile, he looked at Peredur, and asked who the knight was. "Lord," said one of the maidens, "he is the fairest and gentlest youth that ever thou didst see. And for the sake of Heaven, and of thine own dignity, have patience with him." "For thy sake I will have patience, and I will grant him his life this night." Then Peredur came towards them to the fire, and partook of food and liquor, and entered into discourse with the ladies. And being elated with the liquor, he said to the black man, "It is a marvel to me, so mighty as thou sayest thou art, who could have put out thine eye." "It is one of my habits," said the black man, that whosoever puts to me the question which thou hast asked, shall not escape with his life, either as a free gift or for a price." "Lord," said the maiden, "whatsoever he may say to thee in jest, and through the excitement of liquor, make good that which thou saidst and didst promise me just now." "I will do so, gladly, for thy sake," said he. "Willingly will I grant him his life this night." And that night thus they remained. nd the next day the black man got up, and put on his armour, and said to Peredur, "Arise, man, and suffer death." And Peredur said unto him, "Do one of two things, black man; if thou wilt fight with me, either throw off thy own armour, or give arms to me, that I may encounter thee." "Ha! man," said he, "couldst thou fight, if thou hadst arms? Take, then, what arms thou dost choose." And thereupon the maiden came to Peredur with such arms as pleased him; and he fought with the black man, and forced him to crave his mercy. "Black man, thou shalt have mercy, provided thou tell me who thou art, and who put out thine eye." "Lord, I will tell thee; I lost it in fighting with the Black Serpent of the Carn. There is a mound, which is called the Mound of Mourning; and on the mound there is a carn, and in the carn there is a serpent, and on the tail of the serpent there is a stone, and the virtues of the stone are such, that whosoever should hold it in one hand, in the other he will have as much gold as he may desire. And in fighting with this serpent was it that I lost my eye. And the Black Oppressor am I called. And for this reason I am called the Black Oppressor, that there is not a single man around me whom I have not oppressed, and justice have I done unto none." "Tell me," said Peredur, "how far is it hence?" "The same day that thou settest forth, thou wilt come to the Palace of the Sons of the King of the Tortures." "Wherefore are they called thus?" "The Addanc of the Lake slays them once every day. When thou goest thence, thou wilt come to the Court of the Countess of the Achievements." "What achievements are there?" asked Peredur. "Three hundred men there are in her household, and unto every stranger that comes to the Court, the achievements of her household are related. And this is the manner of it, - the three hundred men of the household sit next unto the Lady ; and that not through disrespect unto the guests, but that they may relate the achievements of the household. And the day that thou goest thence, thou wilt reach the Mound of Mourning, and round about the mound there are the owners of three hundred tents guarding the serpent." "Since thou hast, indeed, been an oppressor so long," said Peredur, "I will cause that thou continue so no longer." So he slew him. hen the maiden spoke, and began to converse with him. "If thou wast poor when thou camest here, henceforth thou wilt be rich through the treasure of the black man whom thou hast slain. Thou seest the many lovely maidens that there are in this Court; thou shalt have her whom thou best likest for the lady of thy love." "Lady, I came not hither from my country to woo; but match yourselves as it liketh you with the comely youths I see here; and none of your goods do I desire, for I need them not." Then Peredur rode forward, and he came to the Palace of the Sons of the King of the Tortures; and when he entered the Palace, he saw none but women; and they rose up, and were joyful at his coming; and as they began to discourse with him, he beheld a charger arrive, with a saddle upon it, and a corpse in the saddle. And one of the women arose, and took the corpse from the saddle, and anointed it in a vessel of warm water, which was below the door and placed precious balsam upon it; and the man rose up alive, and came to the place where Peredur was, and greeted him, and was joyful to see him. And two other men came in upon their saddles, and the maiden treated these two in the same manner as she had done the first. Then Peredur asked the chieftain wherefore it was thus. And they told him, that there was an Addanc in a cave, which slew them once every day. And thus they remained that night. nd next morning the youths arose to sally forth, and Peredur besought them, for the sake of the ladies of their love, to permit him to go with them; but they refused him, saying, "If thou shouldst be slain there, thou hast none to bring thee back to life again." And they rode forward, and Peredur followed after them; and, after they had disappeared out of his sight, he came to a mound, whereon sat the fairest lady he had ever beheld. "I know thy quest," said she; "thou art going to encounter the Addanc, and he will slay thee, and that not by courage, but by craft. He has a cave, and at the entrance of the cave there is a stone pillar, and he sees every one that enters, and none see him; and from behind the pillar he slays every one with a poisonous dart. And if thou wouldst pledge me thy faith to love me above all women, I would give thee a stone, by which thou shouldst see him when thou goest in, and he should not see thee." "I will, by my troth," said Peredur, "for when first I beheld thee I loved thee; and where shall I seek thee?" "When thou seekest me, seek towards India." And the maiden vanished, after placing the stone in Peredur's hand. nd he came towards a valley, through which ran a river; and the borders of the valley were wooded, and on each side of the river were level meadows. And on one side of the river he saw a flock of white sheep, and on the other a flock of black sheep. And whenever one of the white sheep bleated, one of the black sheep would cross over and become white; and when one of the black sheep bleated, one of the white sheep would cross over, and become black. And he saw a tall tree by the side of the river, one half of which was in flames from the root to the top, and the other half was green and in full leaf. And nigh thereto he saw a youth sitting upon a mound, and two greyhounds, white-breasted and spotted, in leashes, lying by his side. And certain was he that he had never seen a youth of so royal a bearing as he. And in the wood opposite he heard hounds raising a herd of deer. And Peredur saluted the youth, and the youth greeted him in return. And there were three roads leading from the mound; two of them were wide roads, and the third was more narrow. And Peredur inquired where the three roads went. "One of them goes to my palace," said the youth; "and one of two things I counsel thee to do; either to proceed to my palace, which is before thee, and where thou wilt find my wife, or else to remain here to see the hounds chasing the roused deer from the wood to the plain. And thou shalt see the best greyhounds thou didst ever behold, and the boldest in the chase, kill them by the water beside us; and when it is time to go to meat, my page will come with my horse to meet me, and thou shalt rest in my palace tonight." "Heaven reward thee; but I cannot tarry, for onward must I go." "The other road leads to the town, which is near here, and wherein food and liquor may be bought; and the road which is narrower than the others goes towards the cave of the Addanc." "With thy permission, young man, I will go that way." nd Peredur went towards the cave. And he took the stone in his left hand, and his lance in his right. And as he went in he perceived the Addanc, and he pierced him through with his lance, and cut off his head. And as he came from the cave, behold the three companions were at the entrance; and they saluted Peredur, and told him that there was a prediction that he should slay that monster. And Peredur gave the head to the young men, and they offered him in marriage whichever of the three sisters he might choose, and half their kingdom with her. " I came not hither to woo," said Peredur, " but if peradventure I took a wife, I should prefer your sister to all others." nd Peredur rode forward, and he heard a noise behind him. And he looked back, and saw a man upon a red horse, with red armour upon him; and the man rode up by his side, and saluted him, and wished him the favour of Heaven and of man. And Peredur greeted the youth kindly. "Lord, I come to make a request unto thee." "What wouldest thou?" "That thou shouldest take me as thine attendant." "Whom then should I take as my attendant, if I did so?" "I will not conceal from thee what kindred I am of. Etlym Gleddyv Coch am I called, an Earl from the East Country." "I marvel that thou shouldest offer to become attendant to a man whose possessions are no greater than thine own ; for I have but an earldom like thyself. But since thou desirest to be my attendant, I will take thee joyfully." nd they went forward to the Court of the Countess, and all they of the Court were glad at their coming; and they were told it was not through disrespect they were placed below the household, but that such was the usage of the Court. For, whoever should overthrow the three hundred men of her household, would sit next the Countess, and she would love him above all men. And Peredur having overthrown the three hundred men of her household, sat down beside her, and the Countess said, "I thank Heaven that I have a youth so fair and so valiant as thou, since I have not obtained the man whom best I love." "Who is he whom best thou lovest?" "By my faith, Etlym Gleddyv Coch is the man whom I love best, and I have never seen him." "Of a truth, Etlym is my companion; and behold here he is, and for his sake did I come to joust with thy household. And he could have done so better than I, had it pleased him. And I do give thee unto him." "Heaven reward thee, fair youth, and I will take the man whom I love above all others." And the Countess became Etlym's bride from that moment. nd the next day Peredur set forth towards the Mound of Mourning. "By thy hand, lord, but I will go with thee," said Etlym. Then they went forwards till they came in sight of the mound and the tents. "Go unto yonder men," said Peredur to Etlym, "and desire them to come and do me homage." So Etlym went unto them, and said unto them thus,-" Come and do homage to my lord." "Who is thy lord?" said they. "Peredur with the long lance is my lord," said Etlym. "Were it permitted to slay a messenger, thou shouldest not go back to thy lord alive, for making unto Kings, and Earls, and Barons, so arrogant a demand as to go and do him homage." Peredur desired him to go back to them, and to give them their choice, either to do him homage, or to do battle with him. And they chose rather to do battle. And that day Peredur overthrew the owners of a hundred tents; and the next day he overthrew the owners of a hundred more; and the third day the remaining hundred took counsel to do homage to Peredur. And Peredur inquired of them, wherefore they were there. And they told him they were guarding the serpent until he should die. "For then should we fight for the stone among ourselves, and whoever should be conqueror among us would have the stone." "Await here," said Peredur, "and I will go to encounter the serpent." "Not so, lord," said they; "we will go altogether to encounter the serpent." "Verily," said Peredur, "that will I not permit; for if the serpent be slain, I shall derive no more fame therefrom than one of you." Then he went to the place where the serpent was, and slew it, and came back to them, and said, "Reckon up what you have spent since you have been here, and I will repay you to the full." And he paid to each what he said was his claim. And he required of them only that they should acknowledge themselves his vassals. And he said to Etlym, "Go back unto her whom thou lovest best, and I will go forwards, and I will reward thee for having been my attendant." And he gave Etlym the stone. "Heaven repay thee and prosper thee," said Etlym. nd Peredur rode thence, and he came to the fairest valley he had ever seen, through which ran a river; and there he beheld many tents of various colours. And he marvelled still more at the number of water-mills and of windmills that he saw. And there rode up with him a tall auburn-haired man, in a workman's garb, and Peredur inquired of him who he was. "I am the chief miller," said he, "of all the mills yonder." "Wilt thou give me lodging?" said Peredur. "I will, gladly," he answered. And Peredur came to the miller's house, and the miller had a fair and pleasant dwelling. And Peredur asked money as a loan from the miller, that he might buy meat and liquor for himself and for the household, and he promised that he would pay him again ere he went thence. And he inquired of the miller, wherefore such a multitude was there assembled. Said the miller to Peredur, "One thing is certain: either thou art a man from afar, or thou art beside thyself. The Empress of Cristinobyl the Great is here; and she will have no one but the man who is most valiant; for riches does she not require. And it was impossible to bring food for so many thousands as are here, therefore were all these mills constructed." And that night they took their rest. nd the next day Peredur arose, and he equipped himself and his horse for the tournament. And among the other tents he beheld one, which was the fairest he had ever seen. And he saw a beauteous maiden leaning her head out of a window of the tent, and he had never seen a maiden more lovely than she. And upon her was a garment of satin. And he gazed fixedly on the maiden, and began to love her greatly. And he remained there, gazing upon the maiden from morning until midday, and from midday until evening; and then the tournament was ended, and he went to his lodging and drew off his armour. Then he asked money of the miller as a loan, and the miller's wife was wroth with Peredur; nevertheless, the miller lent him the money. And the next day he did in like manner as he had done the day before. And at night he came to his lodging, and took money as a loan from the miller. And the third day, as he was in the same place, gazing upon the maiden, he felt a hard blow between the neck and the shoulder, from the edge of an axe. And when he looked behind him, he saw that it was the miller; and the miller said to him, "Do one of two things either turn thy head from hence, or go to the tournament." And Peredur smiled on the miller, and went to the tournament; and all that encountered him that day he overthrew. And as many as he vanquished he sent as a gift to the Empress, and their horses and arms he sent as a gift to the wife of the miller, in payment of the borrowed money. Peredur attended the tournament until all were overthrown, and he sent all the men to the prison of the Empress, and the horses and arms to the wife of the miller, in payment of the borrowed money. And the Empress sent to the Knight of the Mill, to ask him to come and visit her. And Peredur went not for the first nor for the second message. And the third time she sent a hundred knights to bring him against his will, and they went to him and told him their mission from the Empress. And Peredur fought well with them, and caused them to be bound like stags, and thrown into the milldyke. And the Empress sought advice of a wise man who was in her counsel; and he said to her, "With thy permission, I will go to him myself." So he came to Peredur, and saluted him, and besought him, for the sake of the lady of his love, to come and visit the Empress. And they went, together with the miller. And Peredur went and sat down in the outer chamber of the tent, and she came and placed herself by his side. And there was but little discourse between them. And Peredur took his leave, and went to his lodging. nd the next day he came to visit her, and when he came into the tent there was no one chamber less decorated than the others. And they knew not where he would sit. And Peredur went and sat beside the Empress, and discoursed with her courteously. And while they were thus, they beheld a black man enter with a goblet full of wine in his hand. And he dropped upon his knee before the Empress, and besought her to give it to no one who would not fight with him for it. And she looked upon Peredur. "Lady," said he, bestow on me the goblet." And Peredur drank the wine and gave the goblet to the miller's wife. And while they were thus, behold there entered a black man of larger stature than the other, with a wild beast's claw in his hand, wrought into the form of a goblet and filled with wine. And he presented it to the Empress, and besought her to give it to no one but the man who would fight with him. "Lady," said Peredur, "bestow it on me." And she gave it to him. And Peredur drank the wine, and sent the goblet to the wife of the miller. And while they were thus, behold a rough-looking, crisp-haired man, taller than either of the others, came in with a bowl in his hand full of wine; and he bent upon his knee, and gave it into the hands of the Empress, and he besought her to give it to none but him who would fight with him for it; and she gave it to Peredur, and he sent it to the miller's wife. And that night Peredur returned to his lodging; and the next day he accoutred himself and his horse, and went to the meadow and slew the three men. Then Peredur proceeded to the tent, and the Empress said to him, "Goodly Peredur, remember the faith thou didst pledge me when I gave thee the stone, and thou didst kill the Addanc." "Lady," answered he, "thou sayest truth, I do remember it." And Peredur was entertained by the Empress fourteen years, as the story relates. 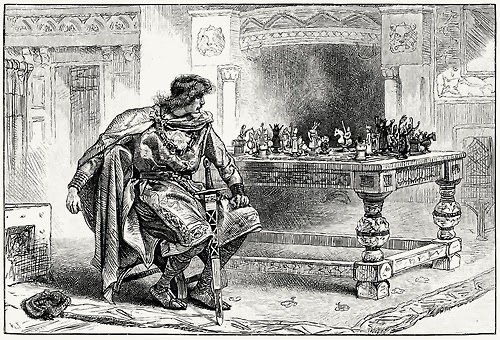 rthur was at Caerlleon upon Usk, his principal palace; and in the centre of the floor of the hall were four men sitting on a carpet of velvet, Owain the son of Urien, and Gwalchmai the son of Gwyar, and Howel the son of Emyr Llydaw, and Peredur of the long lance. And thereupon they saw a black curly-headed maiden enter, riding upon a yellow mule, with jagged thongs in her hand to urge it on; and having a rough and hideous aspect. Blacker were her face and her two hands than the blackest iron covered with pitch; and her hue was not more frightful than her form. High cheeks had she, and a face lengthened downwards, and a short nose with distended nostrils. And one eye was of a piercing mottled grey, and the other was as black as jet, deep-sunk in her head. And her teeth were long and yellow, more yellow were they than the flower of the broom. And her stomach rose from the breast bone, higher than her chin. And her back was in the shape of a crook, and her legs were large and bony. And her figure was very thin and spare, except her feet and her legs, which were of huge size. And she greeted Arthur and all his household except Peredur. And to Peredur she spoke harsh and angry words. "Peredur, I greet thee not, seeing that thou dost not merit it. Blind was fate in giving thee fame and favour. When thou wast in the Court of the Lame King, and didst see there the youth bearing the streaming spear, from the points of which were drops of blood flowing in streams, even to the hand of the youth, and many other wonders likewise, thou didst not inquire their meaning nor their cause. Hadst thou done so, the King would have been restored to health, and his dominions to peace. Whereas from henceforth, he will have to endure battles and conflicts, and his knights will perish, and wives will be widowed, and maidens will be left portionless, and all this is because of thee." Then said she unto Arthur, "May it please thee, lord, my dwelling is far hence, in the stately castle of which thou hast heard, and therein are five hundred and sixty-six knights of the order of Chivalry, and the lady whom best he loves with each; and whoever would acquire fame in arms, and encounters, and conflicts, he will gain it there, if he deserve it. And whoso would reach the Summit of fame and of honour, I know where he may find it. There is a Castle on a lofty mountain, and there is a maiden therein, and she is detained a prisoner there, and whoever shall set her free will attain the summit of the fame of the world." And thereupon she rode away. aid Gwalchmai, " By my faith, I will not rest tranquilly until I have proved if I can release the maiden." And many of Arthur's household joined themselves with him. Then, likewise, said Peredur, "By my faith, I will not rest tranquilly until I know the story and the meaning of the lance whereof the black maiden spoke." And while they were equipping themselves, behold a knight came to the gate. And he had the size and the strength of a warrior, and was equipped with arms and habiliments. And he went forward, and saluted Arthur and all his household, except Gwalchmai. And the knight had upon his shoulder a shield, ingrained with gold, with a fesse of azure blue upon it, and his whole armour was of the same hue. And he said to Gwalchmai, "Thou didst slay my lord by thy treachery and deceit, and that will I prove upon thee." Then Gwalchmai rose up. "Behold," said he, "here is my gage against thee, to maintain, either in this place or wherever else thou wilt, that I am not a traitor or deceiver." "Before the King whom I obey, will I that my encounter with thee take place," said the knight. "Willingly," said Gwalchmai; "go forward, and I will follow thee." So the knight went forth, and Gwalchmai accoutred himself, and there was offered unto him abundance of armour, but he would take none but his own. And when Gwalchmai and Peredur were equipped, they set forth to follow him, by reason of their fellowship and of the great friendship that was between them. And they did not go after him in company together, but each went his own way. the dawn of day Gwalchmai came to a valley, and in the valley he saw a fortress and within the fortress a vast palace and lofty towers around it. And he beheld a knight coming out to hunt from the other side, mounted on a spirited black snorting palfrey, that advanced at a prancing pace, proudly stepping, and nimbly bouncing, and sure of foot; and this was the man to whom the palace belonged. And Gwalchmai saluted him. "Heaven prosper thee, chieftain," said he, "And whence comest thou?" "I come," answered Gwalchmai, "from the Court of Arthur." "And art thou Arthur's vassal?" "Yes, by my faith," said Gwalchmai. "I will give thee good counsel," said the knight. "I see that thou art tired and weary; go unto my palace, if it may please thee, and tarry there tonight." "Willingly, lord," said he, "and Heaven reward thee." "Take this ring as a token to the porter, and go forward to yonder tower, and therein thou wilt find my sister." 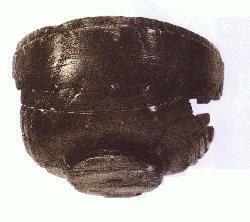 And Gwalchmai went to the gate, and showed the ring, and proceeded to the tower. And on entering he beheld a large blazing fire, burning without smoke and with a bright and lofty flame, and a beauteous and stately maiden was sitting on a chair by the fire. And the maiden was glad at his coming, and welcomed him, and advanced to meet him. And he went and sat beside the maiden, and they took their repast. And when their repast was over, they discoursed pleasantly together. And while they were thus, behold there entered a venerable, hoary-headed man. "Ah! base girl," said he, "if thou didst think that it was right for thee to entertain and to sit by yonder man, thou wouldest not do so." And he withdrew his head, and went forth. "Ah! chieftain," said the maiden, "if thou wilt do as I counsel thee, thou wilt shut the door, lest the man should have a plot against thee." Upon that Gwalchmai arose, and when he came near unto the door, the man, with sixty others, fully armed, were ascending the tower. And Gwalchmai defended the door with a chessboard, that none might enter until the man should return from the chase. And thereupon, behold the Earl arrived. "What is all this?" asked he. It is a sad thing," said the hoary-headed man; "the young girl yonder has been sitting and eating with him who slew your father. He is Gwalchmai, the son of Gwyar." "Hold thy peace, then," said the Earl, "I will go in." 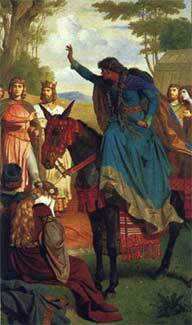 And the Earl was joyful concerning Gwalchmai. " Ha! chieftain," said he, "it was wrong of thee to come to my court, when thou knewest that thou didst slay my father; and though we cannot avenge him, Heaven will avenge him upon thee." "My soul," said Gwalchmai, " thus it is: I came not here either to acknowledge or to deny having slain thy father; but I am on a message from Arthur, and therefore do I crave the space of a year until I shall return from my embassy, and then, upon my faith, I will come back unto this palace, and do one of two things, either acknowledge it, or deny it." And the time was granted him willingly; and he remained there that night. And the next morning he rode forth. And the story relates nothing further of Gwalchmai respecting this adventure. nd Peredur rode forward. And he wandered over the whole island, seeking tidings of the black maiden, and he could meet with none. And he came to an unknown land, in the centre of a valley, watered by a river. And as he traversed the valley he beheld a horseman coming towards him, and wearing the garments of a priest; and he besought his blessing. "Wretched man," said he, " thou meritest no blessing, and thou wouldest not be profited by one, seeing that thou art clad in armour on such a day as this." "And what day is today?" said Peredur. "Today is Good Friday," he answered. "Chide me not that I knew not this, seeing that it is a year today since I journeyed forth from my country." Then he dismounted, and led his horse in his hand. And he had not proceeded far along the high road before he came to a cross road, and the cross road traversed a wood. And on the other side of the wood he saw an unfortified castle, which appeared to be inhabited. And at the gate of the castle there met him the priest whom he had seen before, and he asked his blessing. "The blessing of Heaven be unto thee," said he, "it is more fitting to travel in thy present guise than as thou wast erewhile; and this night thou shalt tarry with me." So he remained there that night. nd the next day Peredur sought to go forth. "Today may no one journey. Thou shalt remain with me today and tomorrow, and the day following, and I will direct thee as best I may to the place which thou art seeking." And the fourth day Peredur sought to go forth, and he entreated the priest to tell him how he should find the Castle of Wonders. "What I know thereof I will tell thee," he replied. "Go over yonder mountain, and on the other side of the mountain thou wilt come to a river, and in the valley wherein the river runs is a King's Palace, wherein the King sojourned during Easter. And if thou mayest have tidings anywhere of the Castle of Wonders, thou wilt have them there." hen Peredur rode forward. And he came to the valley in which was the river, and there met him a number of men going to hunt, and in the midst of them was a man of exalted rank, and Peredur saluted him. "Choose, chieftain," said the man, " whether thou wilt go with me to the chase, or wilt proceed to my palace, and I will dispatch one of my household to commend thee to my daughter, who is there, and who will entertain thee with food and liquor until I return from hunting; and whatever may be thine errand, such as I can obtain for thee thou shalt gladly have." And the King sent a little yellow page with him as an attendant; and when they came to the palace the lady had arisen, and was about to wash before meat. Peredur went forward, and she saluted him joyfully, and placed him by her side. And they took their repast. And whatsoever Peredur said unto her, she laughed loudly, so that all in the palace could hear. Then spoke the yellow page to the lady. "By my faith," said he, "this youth is already thy husband; or if he be not, thy mind and thy thoughts are set upon him." And the little yellow page went unto the King, and told him that it seemed to him that the youth whom he had met with was his daughter's husband, or if he were not so already that he would shortly become so unless he were cautious. "What is thy counsel in this matter, youth?" said the King. "My counsel is," he replied, "that thou set strong men upon him, to seize him, until thou hast ascertained the truth respecting this." So he set strong men upon Peredur, who seized him and cast him into prison. And the maiden went before her father, and asked him wherefore he had caused the youth from Arthur's Court to be imprisoned. "In truth," he answered, "he shall not be free tonight, nor tomorrow, nor the day following, and he shall not come from where he is." She replied not to what the King had said, but she went to the youth. "Is it unpleasant to thee to be here?" said she. "I should not care if I were not," he replied. "Thy couch and thy treatment shall be in no wise inferior to that of the King himself, and thou shalt have the best entertainment that the palace affords. And if it were more pleasing to thee that my couch should be here, that I might discourse with thee, it should be so, cheerfully." "This can I not refuse," said Peredur. And he remained in prison that night. And the maiden provided all that she had promised him. nd the next day Peredur heard a tumult in the town. "Tell me, fair maiden, what is that tumult?" said Peredur. "All the King's hosts and his forces have come to the town today." "And what seek they here?" he inquired. "There is an Earl near this place who possesses two Earldoms, and is as powerful as a King; and an engagement will take place between them today." "I beseech thee," said Peredur, "to cause a horse and arms to be brought, that I may view the encounter, and I promise to come back to my prison again." "Gladly," said she, "will I provide thee with horse and arms." So she gave him a horse and arms, and a bright scarlet robe of honour over his armour, and a yellow shield upon his shoulder. And he went to the combat; and as many of the Earl's men as encountered him that day he overthrew; and he returned to his prison. And the maiden asked tidings of Peredur, and he answered her not a word. And she went and asked tidings of her father, and inquired who had acquitted himself best of the household. And he said that he knew not, but that it was a man with a scarlet robe of honour over his armour, and a yellow shield upon his shoulder. Then she smiled, and returned to where Peredur was, and did him great honour that night. And for three days did Peredur slay the Earl's men; and before any one could know who he was, he returned to his prison. And the fourth day Peredur slew the Earl himself. And the maiden went unto her father, and inquired of him the news. "I have good news for thee," said the King; "the Earl is slain, and I am the owner of his two earldoms." "Knowest thou lord, who slew him?" "I do not know," said the King. "It was the knight with the scarlet robe of honour and the yellow shield." "Lord," said she, " I know who that is." "By Heaven!" he exclaimed, "who is he?" "Lord," she replied, "he is the knight whom thou hast imprisoned." Then he went unto Peredur, and saluted him, and told him that he would reward the service he had done him, in any way he might desire. And when they went to meat, Peredur was placed beside the King, and the maiden on the other side of Peredur. "I will give thee," said the King, "my daughter in marriage, and half my kingdom with her, and the two Earldoms as a gift." "Heaven reward thee, lord," said Peredur, "but I came not here to woo." "What seekest thou then chieftain?" "I am seeking tidings of the Castle of Wonders." "Thy enterprise is greater, chieftain, than thou wilt wish to pursue," said the maiden, "nevertheless, tidings shalt thou have of the Castle, and thou shalt have a guide through my father's dominions, and a sufficiency of provisions for thy journey, for thou art, O chieftain, the man whom best I love." Then she said to him, "Go over yonder mountain, and thou wilt find a Lake, and in the middle of the Lake there is a Castle, and that is the Castle that is called the Castle of Wonders; and we know not what wonders are therein, but thus is it called." nd Peredur proceeded towards the Castle, and the gate of the Castle was open. And when he came to the hall, the door was open, and he entered. And he beheld a chessboard in the hall, and the chessmen were playing against each other, by themselves. And the side that he favoured lost the game, and thereupon the others set up a shout, as though they had been living men. And Peredur was wroth, and took the chessmen in his lap, and cast the chessboard into the lake. And when he had done thus, behold the black maiden came in, and she said to him, "The welcome of Heaven be not unto thee. Thou hast rather do evil than good." "What complaint hast thou against me, maiden?" said Peredur. "That thou hast occasioned unto the Empress the loss of her chessboard, which she would not have lost for all her empire. And the way in which thou mayest recover the chessboard is, to repair to the Castle of Ysbidinongyl, where is a black man, who lays waste the dominions of the Empress; and if thou caust slay him, thou wilt recover the chessboard. But if thou goest there, thou wilt not return alive." "Wilt thou direct me thither?" said Peredur. "I will show thee the way," she replied. So he went to the Castle of Ysbidinongyl, and he fought with the black man. And the black man besought mercy of Peredur. "Mercy will I grant thee," said he, "on condition that thou cause the chessboard to be restored to the place where it was when I entered the hall." Then the maiden came to him, and said, "'The malediction of Heaven attend thee for thy work, since thou hast left that monster alive, who lays waste all the possessions of the Empress." "I granted him his life," said Peredur, "that he might cause the chessboard to be restored." "The chessboard is not in the place where thou didst find it; go back, therefore, and slay him," answered she. So Peredur went back, and slew the black man. nd when he returned to the palace, he found the black maiden there. "Ah! maiden," said Peredur, "where is the Empress?" "I declare to Heaven that thou wilt not see her now, unless thou dost slay the monster that is in yonder forest." "What monster is there?" "It is a stag that is as swift as the swiftest bird; and he has one horn in his forehead, as long as the shaft of a spear, and as sharp as whatever is sharpest. And he destroys the branches of the best trees in the forest, and he kills every animal that he meets with therein; and those that he doth not slay perish of hunger. And what is worse than that, he comes every night, and drinks up the fish-pond, and leaves the fishes exposed, so that for the most part they die before the water returns again." "Maiden," said Peredur, "wilt thou come and show me this animal?" "Not so," said the maiden, "for he has not permitted any mortal to enter the forest for above a twelvemonth. Behold, here is a little dog belonging to the Empress, which will rouse the stag, and will chase him towards thee, and the stag will attack thee." Then the little dog went as a guide to Peredur, and roused the stag, and brought him towards the place where Peredur was. And the stag attacked Peredur, and he let him pass by him, and as he did so, he smote off his head with his sword. And while he was looking at the head of the stag, he saw a lady on horseback coming towards him. And she took the little dog in the lappet of her cap, and the head and the body of the stag lay before her. And around the stag's neck was a golden collar. "Ha! chieftain," said she, "uncourteously hast thou acted in slaying the fairest jewel that was in my dominions." "I was entreated so to do; and is there any way by which I can obtain thy friendship?" "There is," she replied. "Go thou forward unto yonder mountain, and there thou wilt find a grove; and in the grove there is a cromlech; do thou there challenge a man three times to fight, and thou shalt have my friendship." o Peredur proceeded onward, and came to the side of the grove, and challenged any man to fight. And a black man arose from beneath the cromlech, mounted upon a bony horse, and both he and his horse were clad in huge rusty armour. And they fought. And as often as Peredur cast the black man to the earth, he would jump again into his saddle. And Peredur dismounted, and drew his sword; and thereupon the black man disappeared with Peredur's horse and his own, so that he could not gain sight of him a second time. And Peredur went along the mountain, and on the other side of the mountain he beheld a castle in the valley, wherein was a river. And he went to the castle; and as he entered it, he saw a hall, and the door of the hall was open, and he went in. And there he saw a lame grey-headed man sitting on one side of the hall, with Gwalchmai beside him. And Peredur beheld his horse, which the black man had taken, in the same stall with that of Gwalchmai. And they were glad concerning Peredur. And he went and seated himself on the other side of the hoary-headed man. Then, behold a yellow-haired youth came, and bent upon the knee before Peredur, and besought his friendship. "Lord," said the youth, "it was I that came in the form of the black maiden to Arthur's Court, and when thou didst throw down the chessboard, and when thou didst slay the black man of Ysbidinongyl, and when thou didst slay the stag, and when thou didst go to fight the black man of the cromlech. And I came with the bloody head in the salver, and with the lance that streamed with blood from the point to the hand, all along the shaft; and the head was thy cousin's, and he was killed by the sorceresses of Gloucester, who also lamed thine uncle; and I am thy cousin. And there is a prediction that thou art to avenge these things." Then Peredur and Gwalchmai took counsel, and sent to Arthur and his household, to beseech them to come against the sorceresses. And they began to fight with them; and one of the sorceresses slew one of Arthur's men before Peredur's face, and Peredur bade her forbear. And the sorceress slew a man before Peredur's face a second time, and a second time he forbad her. And the third time the sorceress slew a man before the face of Peredur; and then Peredur drew his sword, and smote the sorceress on the helmet; and all her head-armour was split in two parts. 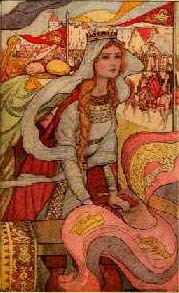 And she set up a cry, and desired the other sorceresses to flee, and told them that this was Peredur, the man who had learnt chivalry with them, and by whom they were destined to be slain. Then Arthur and his household fell upon the sorceresses, and slew the sorceresses of Gloucester every one. nd thus is it related concerning the Castle of Wonders. Footnote 1: It has been suggested that Evrawc = York, from the Latin name Eboracum. Footnote 2: Obviously Gwalchmai, "the hawk of May", is the prototype of Gawain, the hero whose adventures were interwoven with those of Perceval and Parzival respectively. Footnote 3: There is an emphasis on sister's sons in the northern branches of the Mabinogi, which suggests a system of matrilinear descent. Thus Peredur might be the heir of his uncle the Lame King. Footnote 4: There is a suggestion here of the Lord of the Wood and his consort, Diana Nemorensis. See Sir James Frazer's The Golden Bough. 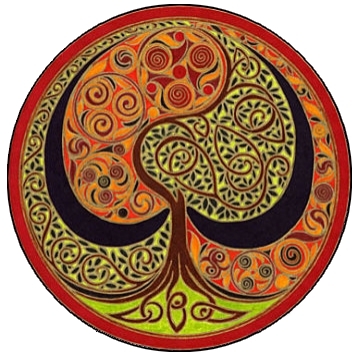 This connection becomes more explicit in Parzival when the hero is told that he must break off a bough from a tree, in order to challenge the Lord of the Wood.